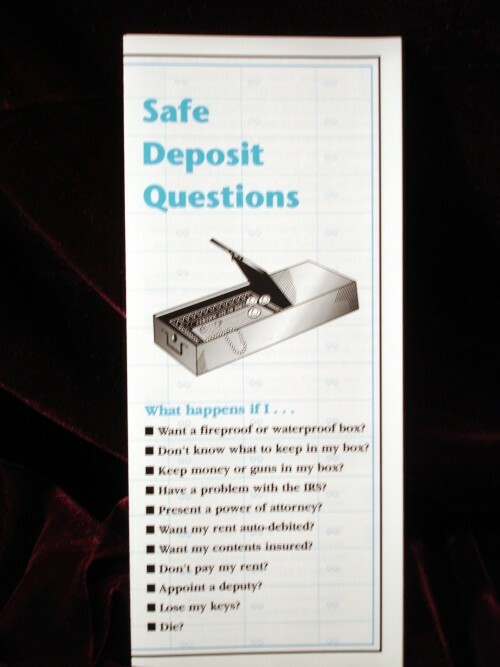 Consumers are asking the same safe deposit questions nationwide. Many employees do not feel comfortable or qualified to answer questions regarding a renter’s death, insurance coverage, vault security concerns or other legal topics. 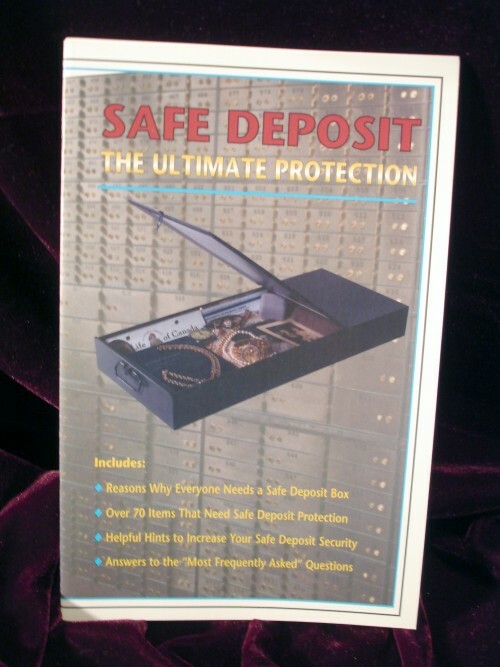 This question and answer brochure addresses the “Most Frequently Asked” questions in a clear, easy to understand format and provides a list of 70 items that could possibly be stored in a safe deposit box. This inventory form encourages consumers to document and protect their most important papers, records and other valuables from fire, theft, or accidental loss. This document also provides a comprehensive list of important valuables; helps a renter identify their security needs and shows them how renting a box can create an effective and organized system. Many consumers think that their financial institution, FDIC or NCUA insures their safe deposit box contents. Historically consumer’s questions about box content insurance have plagued financial institutions nationwide. This comprehensive “no-insurance” disclosure kit provides the correct answers to renter’s questions and concerns and reduces your financial institution’s potential liability. 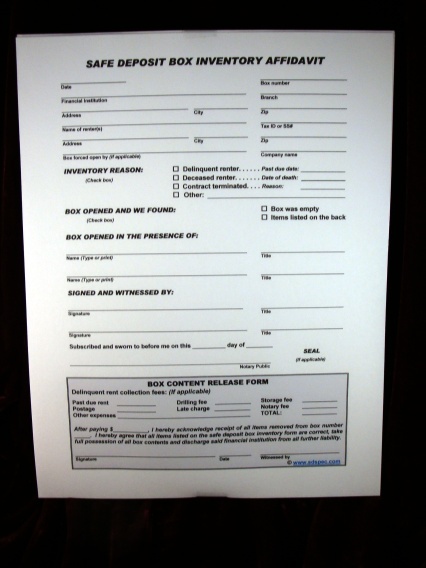 The kit includes two carefully worded desk signs, an 8”x10” lobby sign and 250 “no insurance” disclosure forms. Safe deposit box access and signature documentation are the most critical and important aspects of your vault operation. This box access ticket system provides the safest procedure for allowing vault access to renters and prevents renters from signing the wrong access card. This system can reduce potential liability and provide a valuable defense if ever faced with a safe deposit disappearance claim. 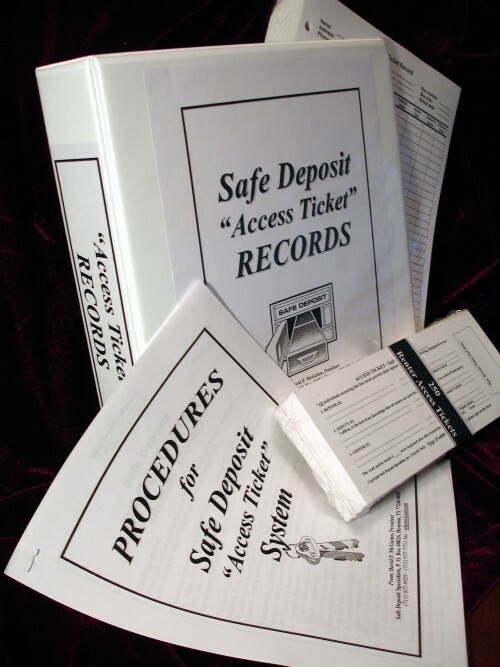 Each system includes a record binder, set of recommended procedures and 250 access tickets and record of access forms. This 250-page vault opening and closing record system establishes correct security procedures. This system documents the correct clock setting time, vault door opening and closing and proper inspection of all viewing rooms and vault. Historically, most safe deposit losses have occurred because renters are “Left in the Vault Alone”. Posting a sign near your vault door and inside each privacy room will help your vault attendant enforce this very important access procedure. 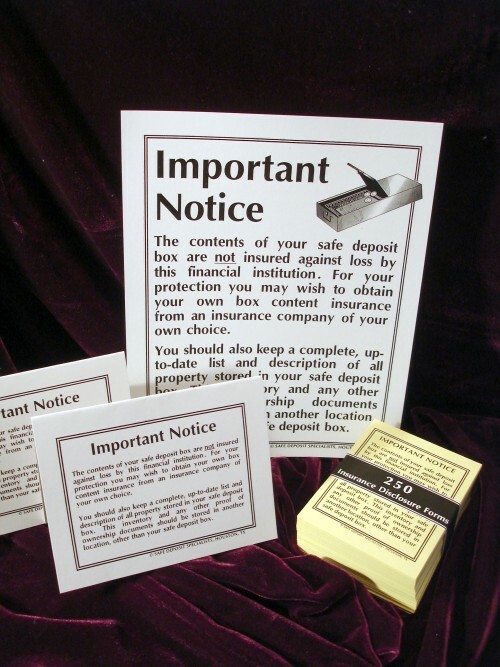 This 8”x 10” sign should be framed to match your safe deposit decor. Two key wallets should be given to each new box renter to store their keys. To protect your renter’s privacy, the renter’s name, box number or vault location should never be printed or written on this envelope. All statements or logos relating to FDIC or NCUA should also be avoided. All keys to un-rented safe deposit boxes should be secured in a dual control system. Both box keys should be placed in a permanently locked, tamper-resistant wallet. When the box is rented, the renter must sign a receipt, tear open the envelope and remove the keys. 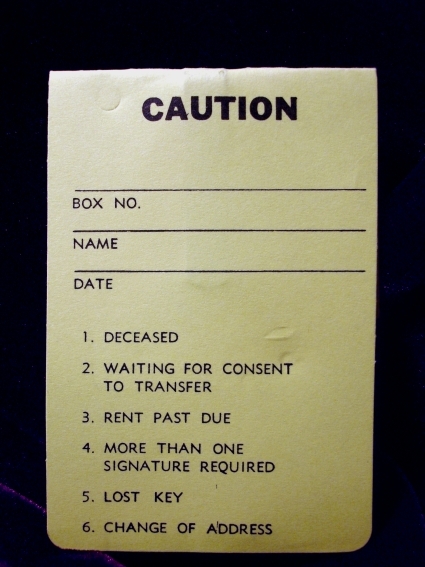 If box access is restricted because of past due rent, a renter’s death, court orders or other legal reasons, this effective caution tab system will immediately alert your safe deposit personnel. These caution tabs attach firmly to the contract, signature card or access card system. All vault access transactions must be recorded and approved by authorized personnel within the financial institution. This procedure must also be followed when a non-renter (i.e. visitor, small child, auditor, locksmith, etc) enters your vault. Without proper documentation, proving that correct procedures were followed will be very difficult. 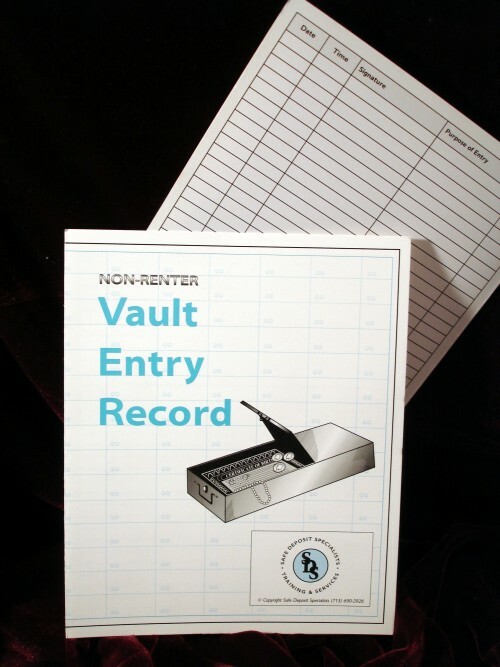 This non-renter vault entry system provides the required vault access documentation. After drilling a delinquent safe deposit box, the institution must inventory and assume custody of all the removed box contents. 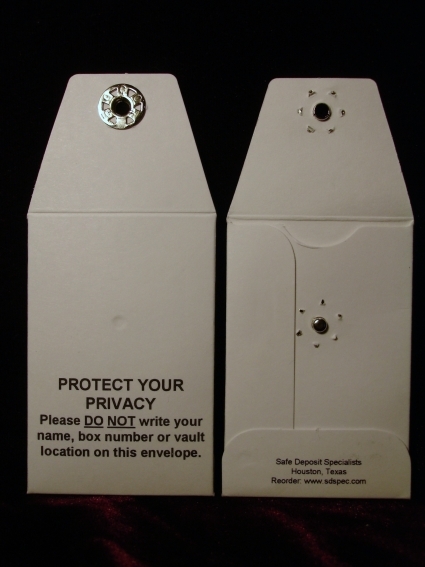 Tamper resistant envelopes should always be used to protect the box contents store these contents in a safekeeping area under dual control. 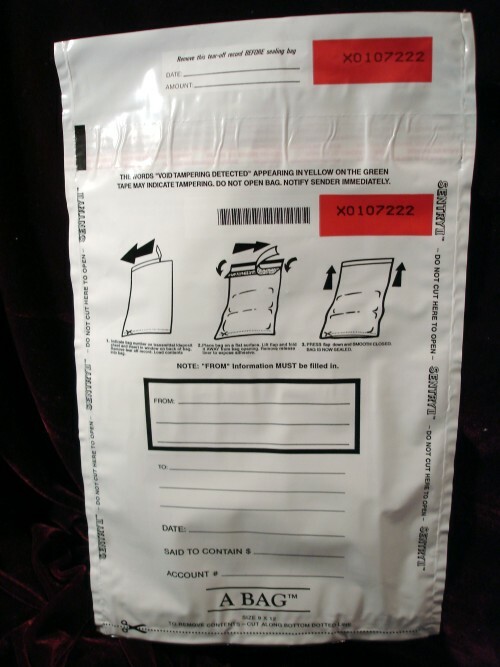 The envelope provides a sequence number and a sealable pouch to secure the box content inventory form. If a renter redeems these contents and makes a claim that contents are missing, this envelope will provide the financial institution with a valuable legal defense. If your financial institution does not have an existing business relationship with your box renter, the USA Patriot Act requires that an “Identification Disclosure Notice” be provided to all “new” box renters or renters added to an existing contract. If a renter is not present when they sign the contract, this disclosure notice must be given to them in writing. Providing this notice will keep your institution in compliance and it is now incorporated into a new and very comprehensive Box Rental Application Form. 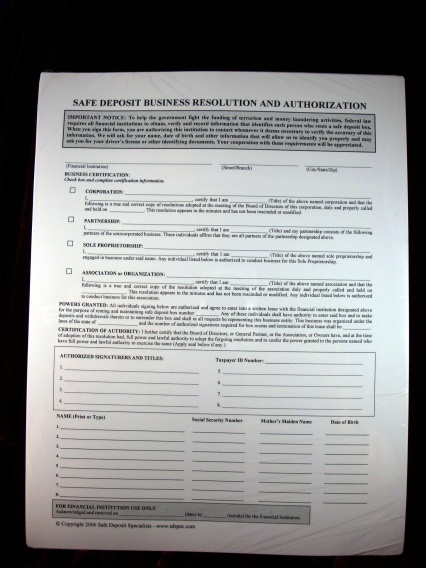 This Business Resolution and Authorization form designates who can rent, access and surrender a safe deposit box rented to a corporation, partnership, association, organization or a sole proprietorship. It complies with all USA Patriot Act federal disclosure requirements. Written procedures are included with your initial order. 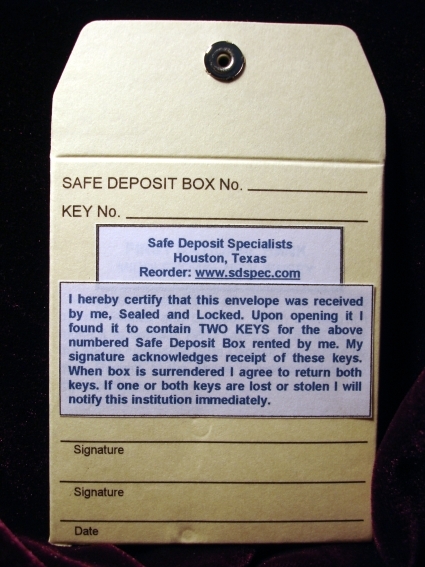 If a box renter loses their safe deposit box keys and the box must the forced open, an authorization form should be prepared and signed by the box renter. 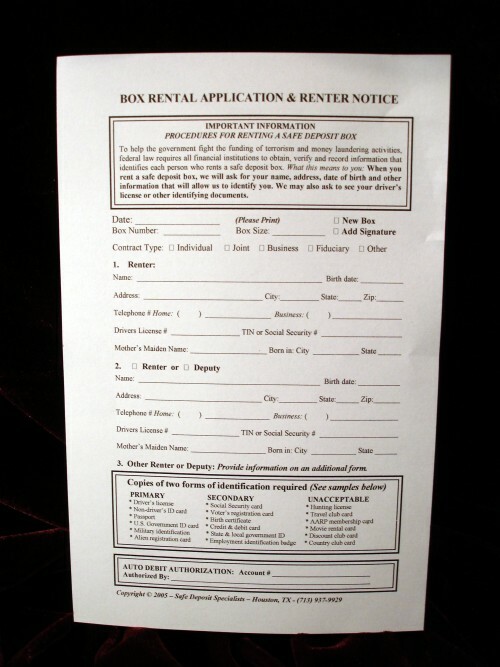 This form must be completed and all forced box entry fees should be collected prior to scheduling a locksmith appointment. 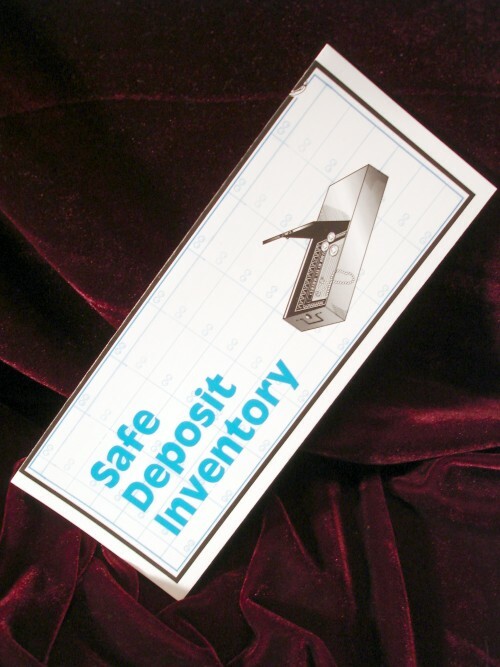 Inventorying a renter’s safe deposit box must be done carefully and documented properly. When an inventory is performed because of delinquent rent, contract termination or a deceased renter, this Affidavit provides an accurate summery of the entire inventory transaction and provides a release clause, if needed. This attractive, four-color, 8½ x 5½ inch booklet is an excellent marketing tool and helps rent more safe deposit boxes. This professional publication makes an ideal marketing handout or gift for meetings with senior citizens, civic groups, school tours, new depositors, trust accounts or officer “call-program” prospects. It answers all of the “Most Frequently Asked” consumer questions about the advantages of renting a safe deposit box.